Tv is something that happens in our house. We have two sets but only one is plugged in. The other still lies packed in a box. Originally destined for the bedroom it was decided six months ago after a house move that we could do without. The bedroom was for other things. Mainly sleep. The TV in the living room is a 30 something inch, black, shiny, HD affair that is used more as a monitor than a portal to timetabled programming. If it were an actual monitor, it would have the necessary internet devices perminantly plugged in and the screen could really come to life. As it is it force feeds us a limited schedual of programs it thinks we may like to watch. If it’s my finger turning it on, it’s to temporarily pacify our 2 year old with some psychedelic kids show. Occasionally it plays a DVD that somehow found it’s way into the weekly shop. Very rarely, on special occasions, it displays what the Xbox plays. I’d rather it not be there. It’s often turned on by others for background noise and that’s just what they get. Noise. Sometimes, like last night, I’ll walk into the noise with a plate of food and witness a science programme showing me something amazing I have never seen, I have never known. Quite often this is delivered to me by the BBC and I think, “I paid for that… Money well spent.” This happens about twice a year. All my news, entertainment, current affairs and education comes to me through the other screens. The iDevices and laptops strewn around the house. 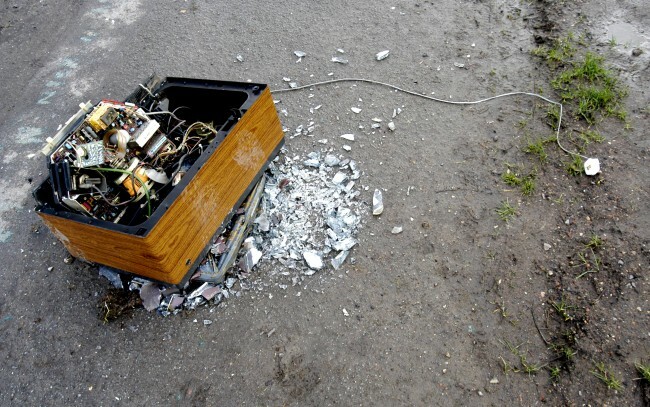 TV “broke” for me 10 years ago when I got a TiVo (yes, they were available in the UK). Since then, with the exception of Doctor Who and the occasional glance at the news, I’ve not watched a live broadcast. In the last 6 months, we noticed that most of the TV we watch is either on DVD or *cough* downloaded. I wait to see what my friends are raving about then watch it. So TiVo has also died for me. It’s currently unplugged and looking a little forlorn. The TV is there for playing on the Wii with friends. The TV is there for when I just want to veg out with a box set. The TV is there for me to plug in a laptop if I want a ridiculously large screen. Having a projector & surround sound killed of going to the cinema for me. I don’t miss going in the slightest. I’m trying to think about how I feel about (broadcast TV) going. It was, no doubt, a formative part of my childhood – but now I appear to have out-grown it. Hi @Edent. Thanks for the comment. I totally missed the TiVo era. Thought about it for a while. I think we have very similar viewing habits. TV died for me years ago. I no longer watch live TV, with the exception for maybe the odd BBC documentary or Match of the Day. TV doesn’t fit in with my schedule or lifestyle, nor is it flexible enough to make it fit in. My TV is now my main Xbox / PS3 output or PC out screen. It’s a year after writing this post and I recently splashed out a £99 on an Apple TV. I know, i’m very late to the game, especially as this isn’t the first generation. I’m not using it to purchase content, I’m using it to view the web or to stream the web from a hand held device. In many ways my TV has become a complicated dumb screen as I often have to press a host of buttons on the remote just to get it to display what I want. I’m thinking my next purchase may be a simple wireless HDR display (when they come out) interestingly 3D or anything with ‘smart’ in it’s name doesn’t even cross my mind. I’d love to hear what others think or predict the direction of the TV and the TV companies are. As a follow up, shortly after the post, I sold my TiVo. My TV is beginning to show its age. I was thinking of getting FreeView HD but I never really watch broadcast TV. It may even be worth me just getting a monitor, no tuner. channel a show is on. People consume TV shows as discrete entities. That’s why TV companies are desperately trying to create “event tv”. people on the same channel (or family of channels). Of course, everyone with an interest in comedy has already downloaded the series or watched it on YouTube. I like TV shows. I just don’t like TV channels. I like watching TV shows. The TV in the corner is just one of screens I enjoy using. Give me the shows I want in a way that lets me watch on phone, tablet, and TV. Or I’ll go off to your competitors who do it better. Sure, they’re pirates, but at least they meet my needs. Cheers @TerenceEden:disqus another quaity epic comment with some great points. I love that in a year you have moved on again. Our viewing habits are perpetually evolving with the tech but our love for decent, engaging content remains the same. The same frustrations remain though. I see the BBC are now offering all the content all the time on all the screens. ..Providing you like sport. Oh well. It is certainly a step closer to where we want to be. The accessible micro payment system for purchasing shows cheaply at the same time as everyone else in the world must be just around the corner.. *fingers crossed*. Either that or we will all soon be speaking pirate. 1. We have an old-school tube TV, which we deliberately bought a few years back. At the time we decided we didn’t actually need a flat screen, or anything particularly big. We still don’t – when a big screen is off, it’s like a black hole in the corner of the room. 2. We watch it a fair bit, via a digital freeview recorder box. TV Pause is useful, as is being able to record films (usually late night ones, like Kull the Conqueror.) We like films. Sometimes we’ll put kids TV on for the boy, but not so much to make it habitual. 3. I keep thinking about how to hook digital media up to the TV, because I/we hate watching stuff on laptops. I think we have an LCD monitor in the house, but we haven’t used it for years since moving to laptops/phones. I have an old VGA->RGB converter which does actually work with my laptop, I’ve found out recently, but we haven’t actually used it beyond that. Maybe we will. 4. My parents have recently got a new TV with the media sharey type stuff on it. I was actually pretty impressed that I could stream photos from my phone to the TV (I’d already installed the software on my phone after playing with an Airport Express). I think there’s mileage in that, in the same way people used to plug the video cameras into TVs for playback at the end of the day. I can imagine using any device as a remote *and* content source is actually pretty powerful. But it still feels slightly “off” – like it could be smoother. Maybe Apple do it better. 5. We always talk of getting a projector, but mainly as a way of getting rid of the black hole and clearing some space. Our friends have one (actually their first one was made from a laptop screen and an OHP), and it’s quite fun, especially when you can play games and Winamp visualisations on it. One day I’d like to get one, probably. 6. But really, it seems too easy to acquire content from wherever (photos, videos, playlists, etc) and then to never watch/listen to it. Which makes me beg the question, why do I have it? Overall, I think there’s an interesting polarity appearing in how we consume content. At one extreme, there’s “big consumption” which we invest time into – like watching a film. We like to have “big tech” for this that’s often unwieldy and expensive. Cinemas embody this too. This isn’t TV currently though, which tries to span more than this – and in general provides content (half-hour to an hour long) that isn’t this kind of “big” consumption. At the other end of the scale, there’s “micro consumption”, akin to the way Twitter offers us microtexting – small snippets of loose content, which can be consumed through small screens and without too much attention. Most people like to use both. Some people will do more of one than the other, depending probably on their lifestyle. Thanks Graham. Love your big/micro content point. I wish I could search content on the tv like i can in my iTunes library. i.e.I have 20 mins to spare or 1 hour before bed and these are the things I can choose from. I too have toyed with getting a projector but I think that by the time they will be silent and unobtrusive we will be at a point where we can paint a screen on the wall. At least that’s what I am hoping. Very true – and it’s interesting watching toddlers ‘use’ TV if they’ve been exposed to iPads or touch phones first. I once caught myself trying to swipe a Flickr photo gallery of mine on my computer screen, after my first month using iPhone after it came out. It confused my brain for half a second as to why I’d even done that! Static screens just aren’t intuitive any more – they just feed stuff out. I only watch TV now because we have TiVo (and tbh I only have the full package because my other half works for Virgin, we get it super cheap!). It learns what you like to watch and automatically records – I often find things I didn’t even know were on, but of real value. Historical documentaries, Attenborough etc. And if has learned never, ever to record any soaps or reality TV programmes so I’m never inflicted with those. Genius! I forgot about the Apple TV – we got one about a month or so ago after having a think as to whether we’d use it enough or not. And we use it all the time – Nick watches his podcasts on it while getting ready for work, I play pranks hijacking it via my iPhone when he’s listening to music (haha), and we’ve got our entire DVD collection on the computer to stream through to the TV when we need it, and tucked the DVDs themselves away to de-clutter the living room. It’s all about on-demand for me now – I rarely watch live TV. But I have noticed the BBC particularly noticing this, and getting in on the live programs. I’ve specifically watched Planet Earth Live and Stargazing Live as I wanted to see those as they happened – and I noticed they tied in social media with those very heavily to get people into it and not watching a recorded one. We’ll see more of that I think. Strangely had this conversation whilst visiting my mother at the weekend. She watches a lot of TV, and has in the last three months moved to the Virgin Tivo package. She was saying she probably still watches the same amount of hours, but as a result she is watching about 50% less ‘live’ TV. She now mostly watches recorded and time shift programmes. Talking about my kids (13 & 15), they now watch virtually no live TV at all. The TV’s they each have are purely for DVD or XBOX playback nowadays. TV is consumed via the catch-up sites on laptops (iplayer, 4OD) – though I’m sure if I was to purchase necessary adapters/media players they would prefer to view via the TV, and use the laptops to facebook/tweet/tumblr about what they were watching. Personally I’m also watching less and less live broadcast and more via catch-up and downloaded/streaming via AppleTV. Shows such as Game of Thrones ( http://goo.gl/G4Q3X ) have shown that the appetite to view content is very much alive, its the limited access to it via very linear channels which is now the issue. I think the market is ripe for a proper internet enabled TV (not the current crop with slow, limited and incompatible widgets) that allows you to subscribe to individuals shows from around the world. Google attempted this with GoogleTV and presumably this is what the rumours of an Apple TV relate to. To really work though it requires the networks and production companies to buy into the idea of streaming shows to individual end users rather than selling series to networks. This of course is underpinned by a unified method of payments. For all its faults this is why iTunes and the App Stores have been so successful. Purchasing content from multiple vendors is transparent and simple. However as we have seen time and time again, content is the driving force and good content will always find a market. So in my experience the TV itself isn’t broken, more the transport (broadcast) mechanism that TV currently relies on. Thanks Nik, Great comment with great examples. I have to agree with much of what you said. Especially your closing statement. If the app store environment worked seamlessly on an off the shelf TV (and if my naff broadband would allow) I would certainly be buying individual shows over the DVD’s. I’d like to keep those shows on a hard drive though. Lets see what Apple have up their sleeves. If anything. Whatever happens in the next move I feel a very big shakeup is inevitable. All we need now is more great content and less of the stuff trying to force us to the screen at a particular time. Any thoughts on second screens? I’m thinking Microsoft’s recently announced Xbox SmartGlass app for Windows, iOS and Android devices for example! At the moment the iPad is my second screen but instead of being a compliment to the main, it’s a replacement to. Looking forward to seeing how SmartGlass pans out. My family had a TV for only a few years when I was a child. Even when we owned a TV my viewing hours were restricted to a bare minimum of half an hour a day and one hour on Sunday. As an adult, I have lived with TV-owners and spent moderate amounts of time in front of the idiot box. In 2000, I bought my own TV mainly to use as a monitor for watching narrative or documentary films on video cassette. I also watched news programmes. I moved to the UK in 2008 and decided against owning a TV. Instead, I took out a membership at a company that sends films to me via the Royal Mail postal service. I watch those on my laptop. I watch TV programming on my computer at work. I have an application on my desktop, which allows me to watch a myriad of channels via RealPlayer.I don’t miss it, but perhaps because I wasn’t really indoctrinated into it when I was a child. Agreed, but then they serve practical purposes — allowing ease of writing and communicating. A computer trumps the old typewriter any day. I still recall the thrill of the electronic type writer and what an innovation it seemed with its mini-screen.